Downs Lake is a very weedy lake (lots of lily pads as well) which is great for fishing but not so great for other water sport activities. Still in Spring and early summer there is a good amount of open water near the resort, and also via one open channel through the lily pads to the east and there is a big space of open water to the west of the boat launch. The lake is 2.2 miles long with a water depth of 5-30'. Downs warms up earlier than other area lakes because it's located in the southwest corner of Spokane county (partially in Lincoln County). There are very few trees around this lake and so the wind can really rip across it for some fun sailing. Fishing: The marshy shoreline is a sure bet for Largemouth bass warming after the winter months. The deep water at the north end is where the "Bows" think they're safe. 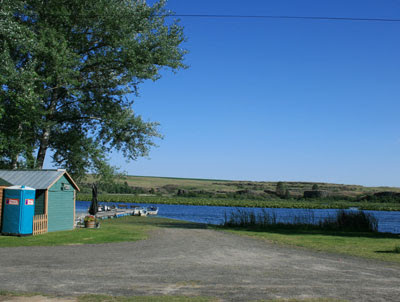 There is Downs Lake Resort with a small boat launch (only boat launch on the lake) with a $5 fee. There is a power line near the boat launch so if you come to sail on this lake you will need to step your mast near or on the water. The resort has RV & Tent sites, plus fishing boat rentals with or without electric motors. Directions: You can access Downs Lake Resort via Martin Rd from Sprague (exit 245) on Old State Hwy, and then turn on road with sign to the resort. Downs Lake Resort (509) 235-2314, 28605 W Martin Rd, Cheney, WA. 99004. Maps: View printable lake map below. To view a map click on google.com/maps and type in Downs Lake, WA. ACCESSIBILITY: PARKING... Gravel/dirt parking area; PATHS/TRAILS... None. Lawn area leads to shoreline. Beware of deep mud; RESTROOMS/FACILITIES… Restroom but not ADA accessible. There are primitive area to picnic areas, drinking water available; SENSORY... No sensory tactile markers for those with visual and other impairments. DOCKS/LAUNCHES/PLATFORMS… Two old docks, none of which are considered ADA accessible; DIRECT WATER ACCESS… No access for wheeled mobility devices; TRANSFER SYSTEMS... None; CAMPING... primitive tent and RV camping (no hookups); O.T.H.E.R… Oddities/Barriers: Deep mud during wet times of the year; Terrain: Level to about 3% grade at launch; H2O/Water: Water normally murky. Lake is full of lily pads (great habitat for fish and waterfowl. 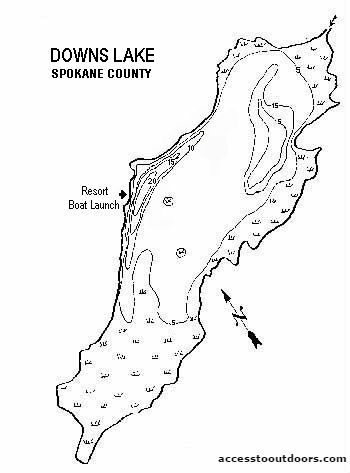 Water temperature in the summer can be around 60 to 70 degree; Environmental Conditions: Nothing unusual; Resources: Food, drinks, and gas in town of Sprague next to I90 or at Klinks William Lake Resort.